Save on SSDs across both Amazon US and UK, and at Newegg. Solid state drives are a useful thing to pick up in big retailer sales, and for Amazon Prime Day, there are great deals on fast storage across Amazon US and UK. We've decided to round them up to make them nice and easy to find, and so you can get an at-a-glance look at the reduced prices. You can find out more about the SSDs below on our best SSDs for gaming guide. If you want this year's stuff, here's where the Amazon Prime Day 2019 PC deals will live. The cheapest this SSD has ever been on Amazon US, and probably the right capacity for many PC players. This is one of the lowest prices we've seen for a 480GB SSD. It sold out yesterday, but is now back in stock with a nice discount absent of any promo codes or mail-in-rebates. Here's another 480GB SATA SSD that is marked down to $74.99, with similar performance ratings as Adata's SU650. As with most SSDs in this capacity and general price range, it uses 3D TLC NAND flash memory. 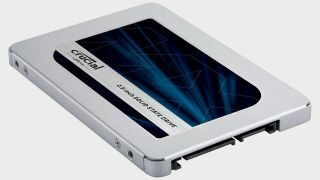 Yet another 480GB SATA SSD that is on sale for $74.99, one of the lowest prices we've ever seen for this capacity. Like the Adata and Silicon Power driver, there are no coupon codes or mail-in-rebates, just an upfront discount.